Billbergia nutans or Queen's-Tears, a native of Brazil, is one of the most common Bromeliads grown. The tall (12 inch) plant is dark green on the outside with light green with cream-colored spots on the interior of the vase. They are a durable plant for the home -- often withstanding periods of neglect. Blooming Time: Pendulous flower clusters on long pink stems at any time of the year. Culture: Billbergia nutans need partial shade to bright indirect light with moderate temperatures. In the greenhouse, we use a soil mix consisting of 3 parts peat moss to 2 parts sand to 1 part loam. The mix should be neutral to slightly acidic. The vase should be kept filled with water and the soil should be allowed to dry between waterings. Fertilize monthly with a balanced fertilizer diluted to ½ the strength recommended on the label. The bromeliad will flower when it reaches maturity. They can be forced to bloom at any time by enclosing the plant (with its cup empty to prevent excessive humidity buildup) in a plastic bag with a ripe apple. The apple gives off ethylene gas, which stimulates flowering in Bromeliads. Leave the plant and apple in the plastic bag for 7-10 days; the plant will flower in 1-2 months. Propagation: Billbergia nutans are propagated by the removal of offsets after flowering. 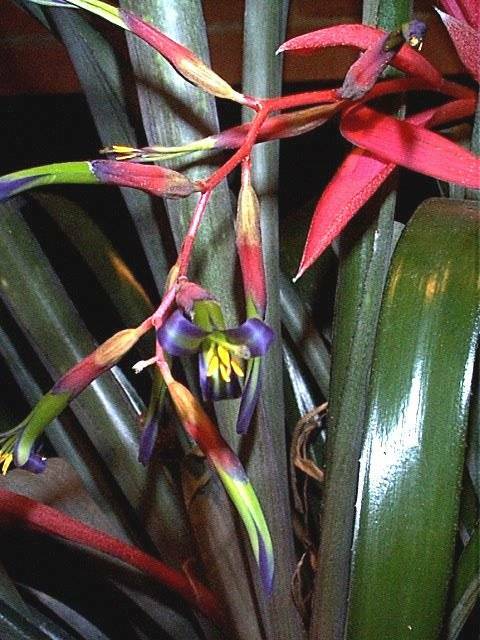 Billbergia nutans was featured as Plant of the Week November 2-8, 2001.